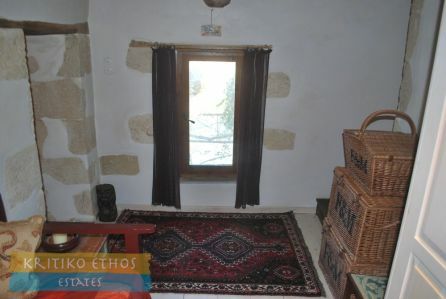 Truly a great value for a wonderful home in a superb location! 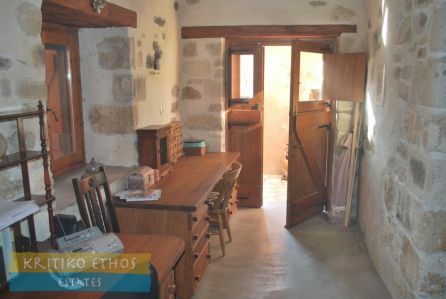 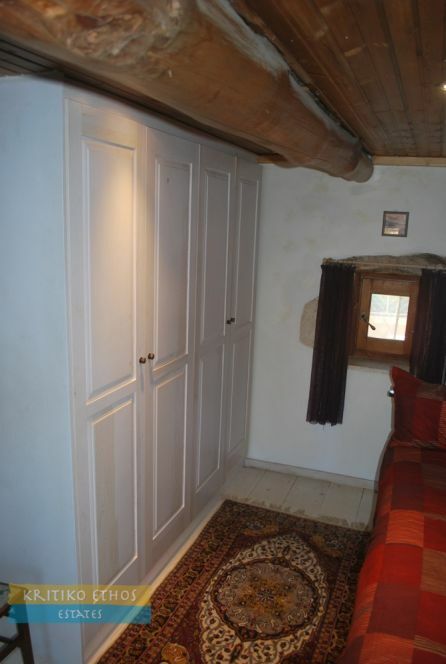 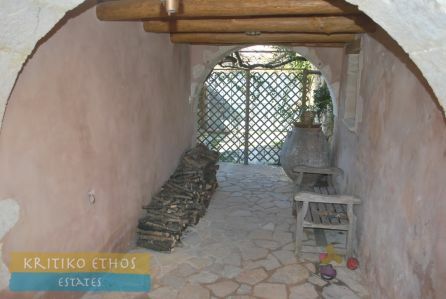 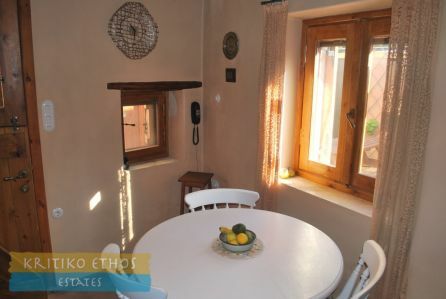 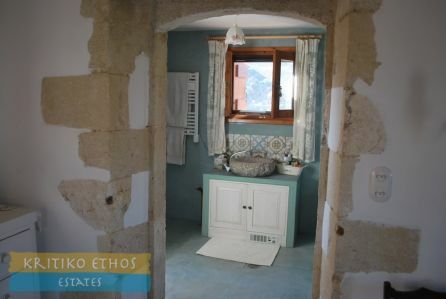 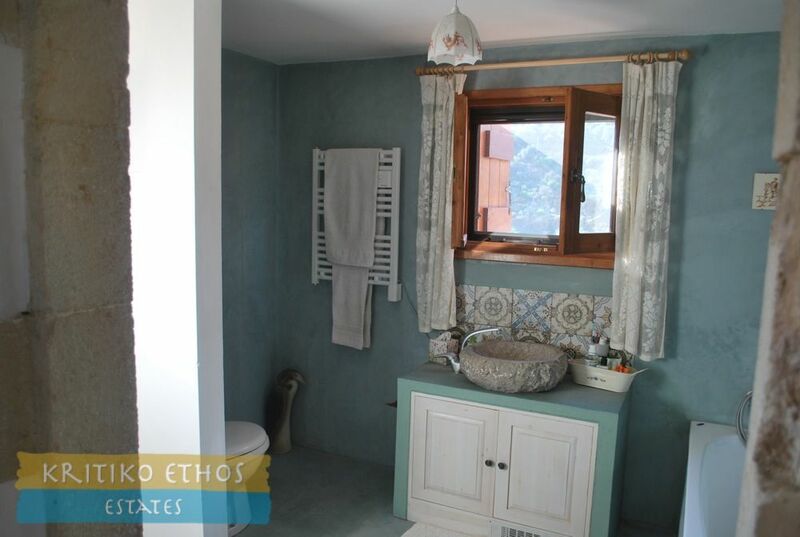 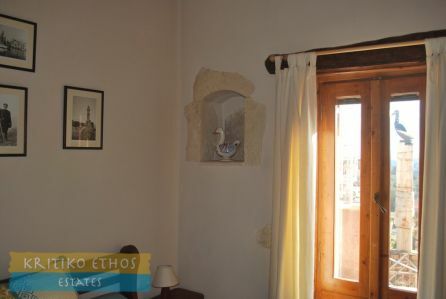 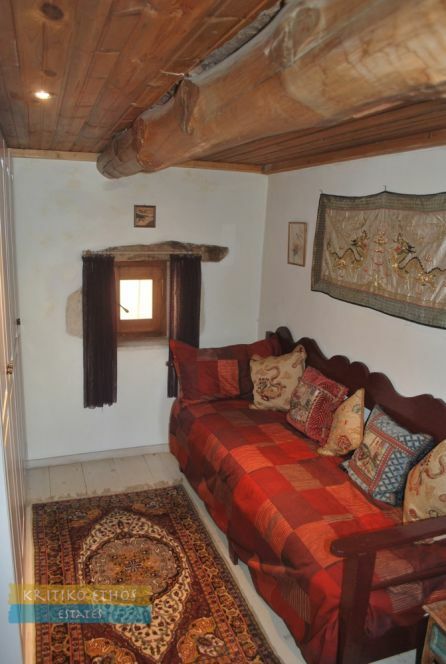 This lovingly restored and very unique home in the traditional village of Vafes offers an excellent high quality residence with all modern amenities set in a very rustic and charming atmosphere. 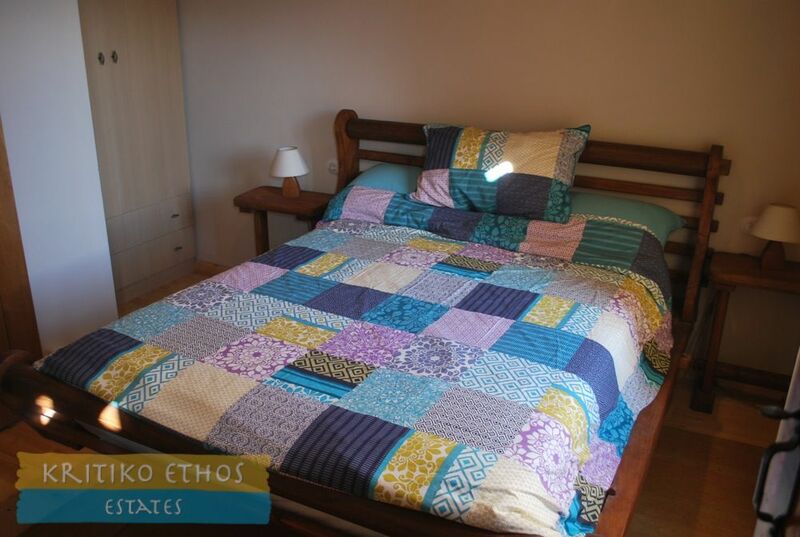 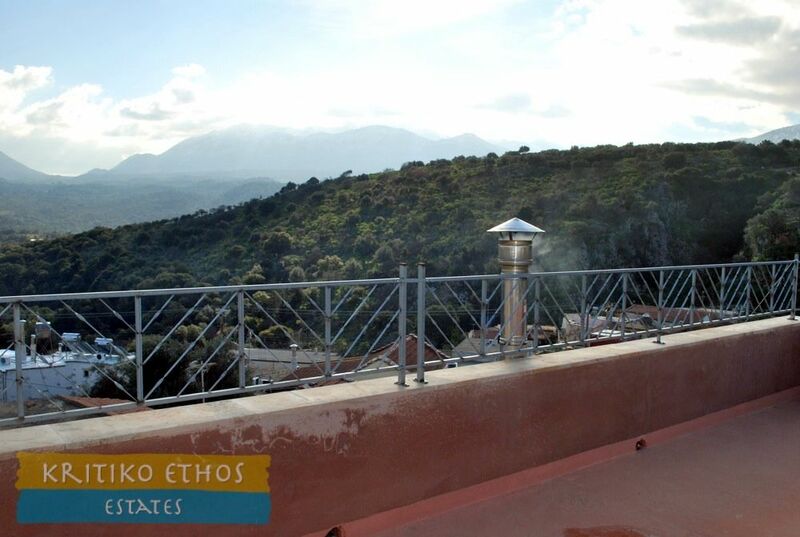 The Greeks describe a home as ζεστό (pronounced zesto, meaning warm) when it gives warmth to the heart. 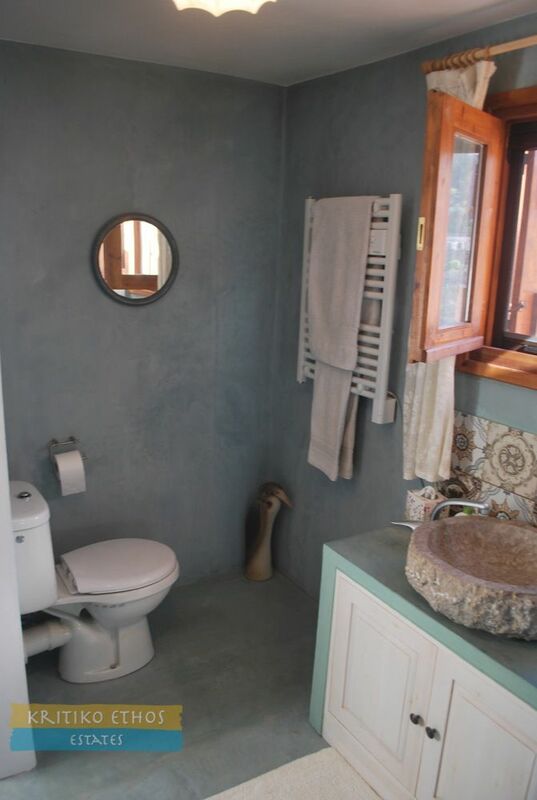 This home is indeed very zesto! 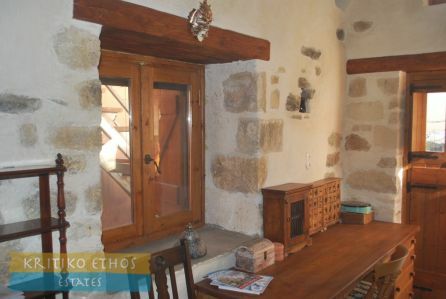 Several centuries old, this 163.89 sqm home has been painstakingly restored to retain all of its original charm and features and yet provide the very best in Cretan living ... just steps from the cool and welcoming village plateia village with its extensive social networking opportunities (no, not Facebook! 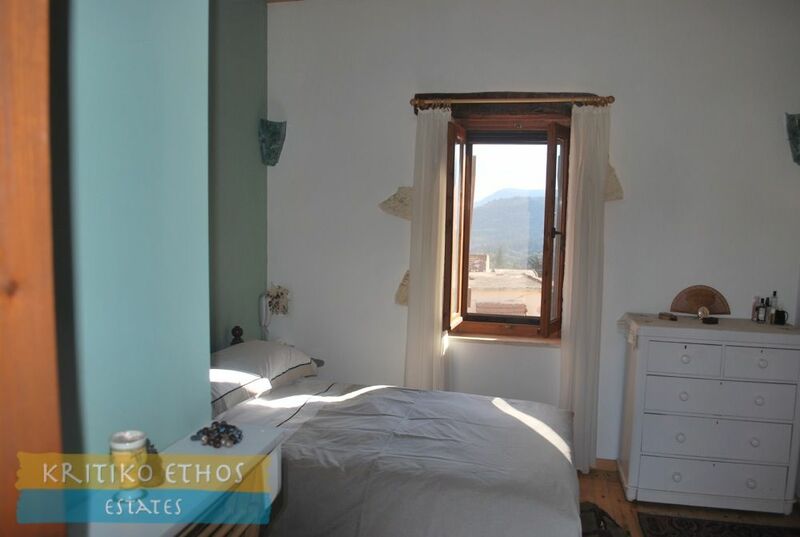 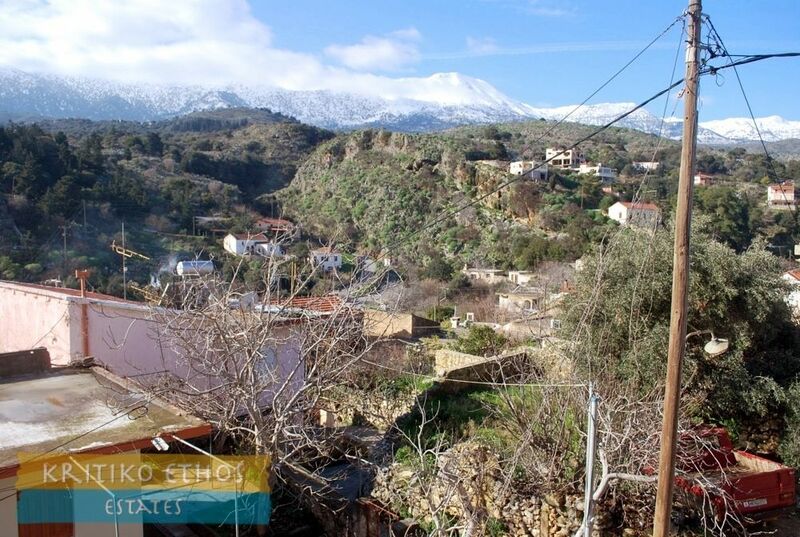 ), fantastic mountain views as well as a sea view from the terrace, and just a short drive to the riverside village of Vrysses with all its fine amenities. 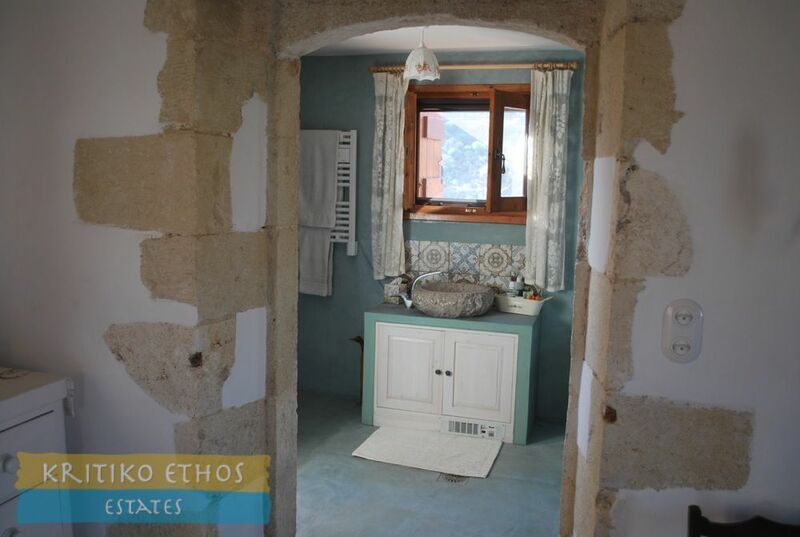 A careful viewing will reveal many small features (figures cut into the stonework, lovely niches, and more). 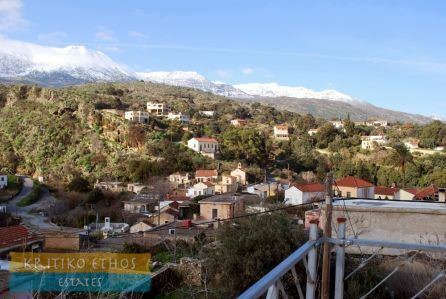 And just slowly nursing a coffee in the appropriate Greek style in the nearby village kafenion will complete the ambiance. We would like to thank the owner of this home for the following detailed description of the home and its history as well as notes on the local village. 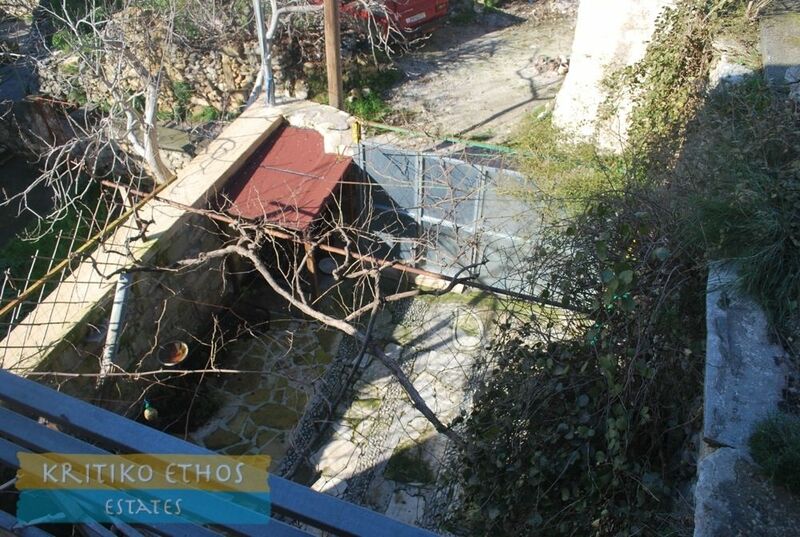 This is a rare opportunity to acquire a historic property, in the heart of the village of Vafes. 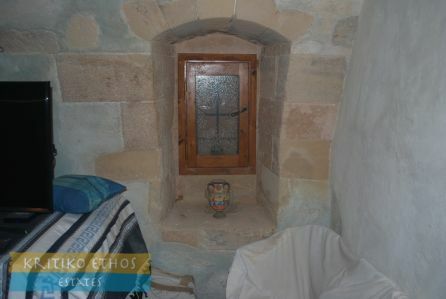 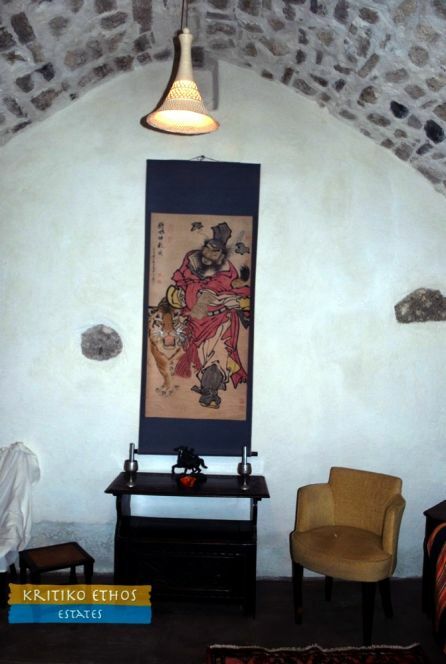 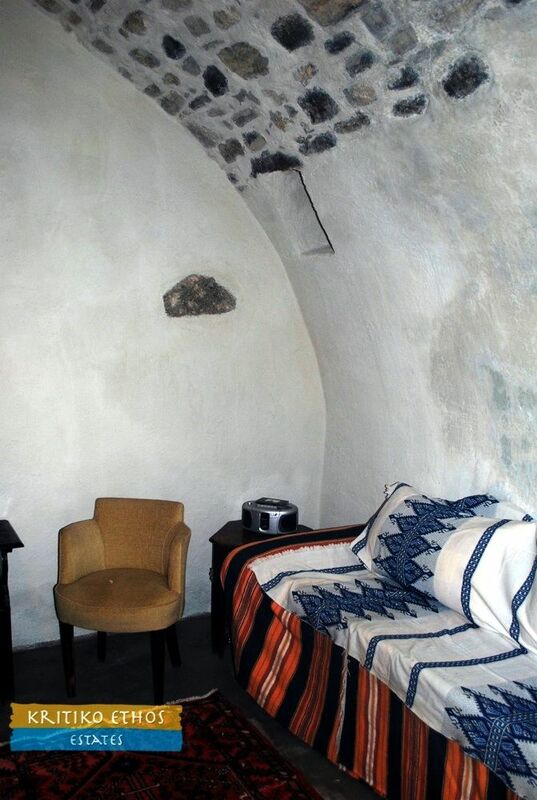 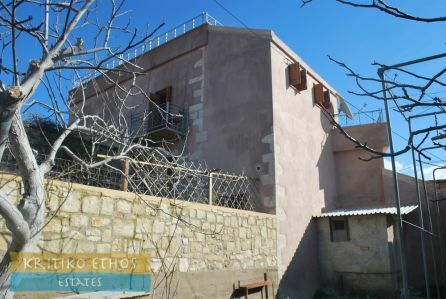 Parts of this unique property are reputed to date back about 500 years, to the time of the Venetian occupation of Crete. 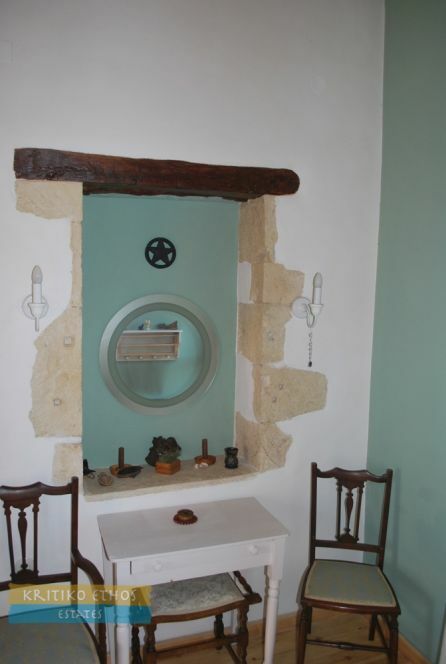 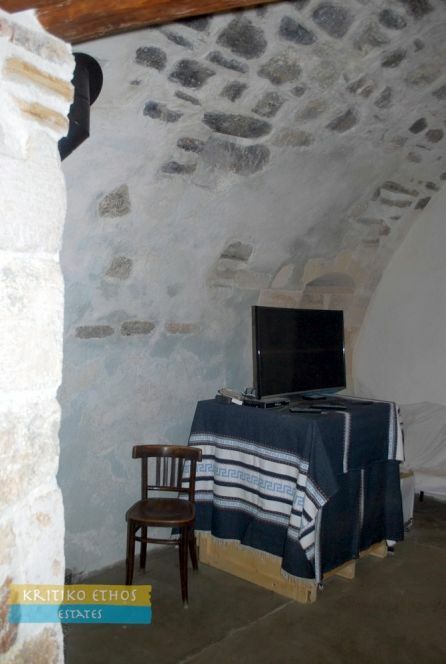 It has been renovated to an exceptionally high standard, in accordance with archaeological office guidelines, in order to retain its authenticity. 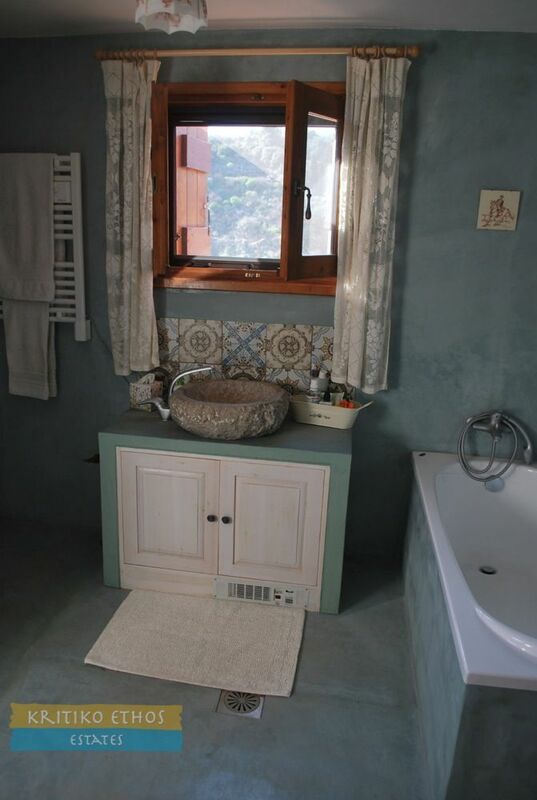 Throughout, the timber windows and traditional doors, together with the original exposed stonework surrounds, are in keeping with the period of the property. 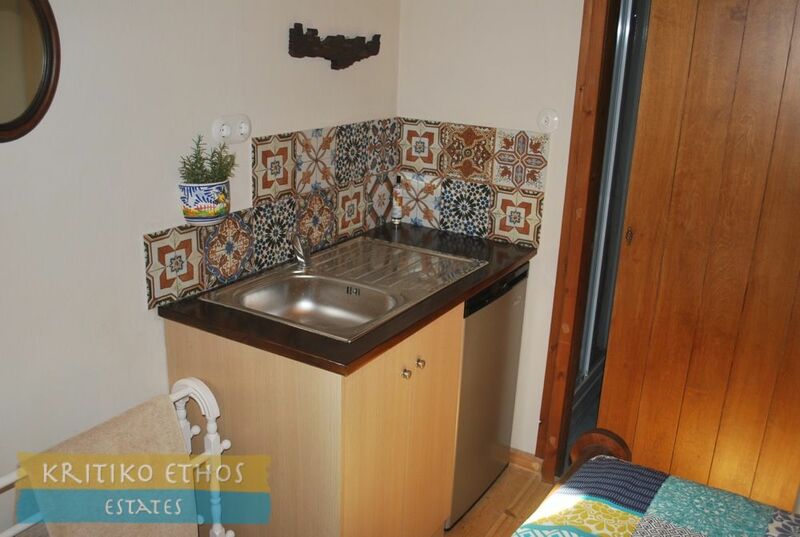 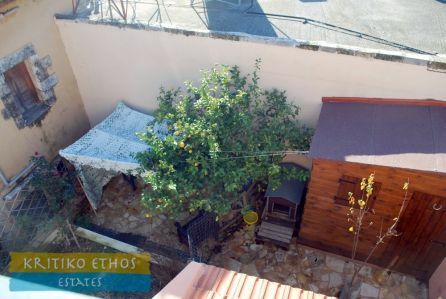 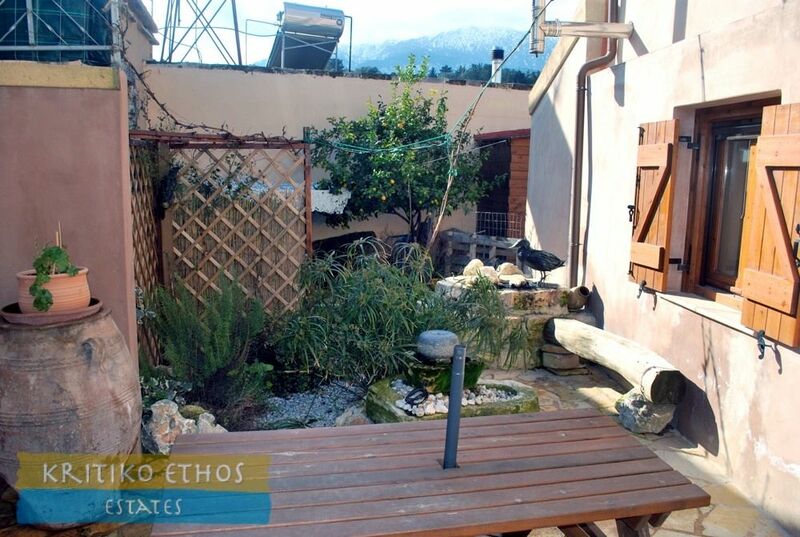 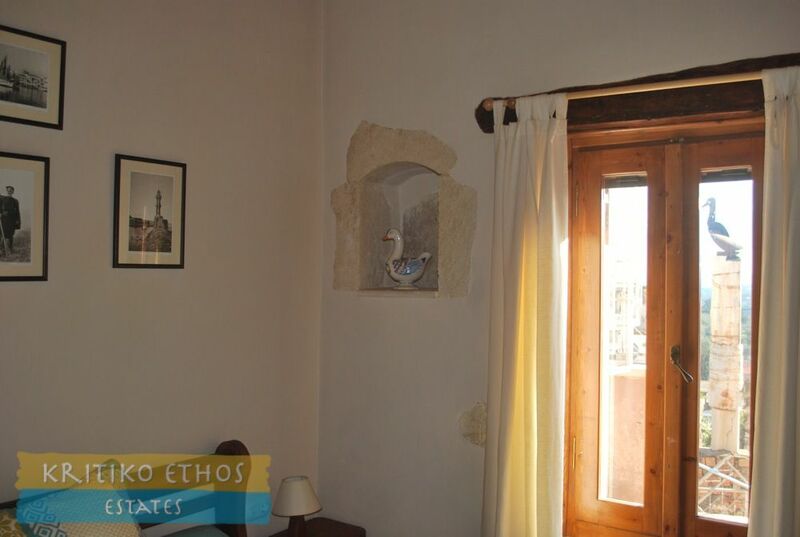 At the front of the 226 sqm property, there is a shady, secluded, paved courtyard, with ample room for parking. 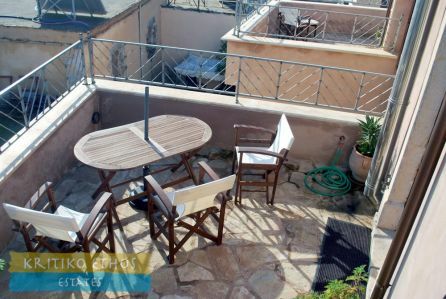 The larger courtyard at the rear of the property is partly paved, providing an area for outside dining, with an external staircase to the upper floor. There are a number of fruit trees in the courtyard, including lemon, orange, pomegranate, quince and achlomelo as well as a prolific vine, jasmine, rose and a variety of herbs. 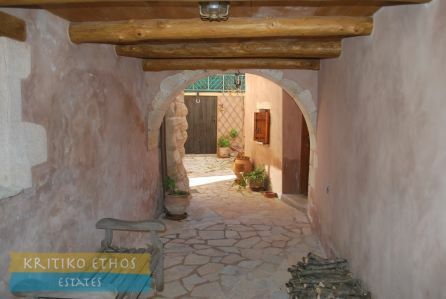 Entry to the rear courtyard is through two ancient camaras (arches), with timbered ceiling. To the left are two large rooms with magnificent, vaulted stone ceilings, said to have been used as stables in earlier years. 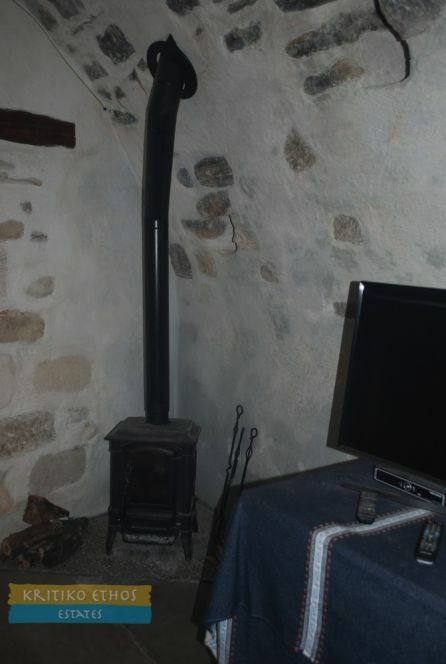 A wood-burning stove keeps these rooms warm in winter while the thick stone walls ensure that they remain cool during the summer months. 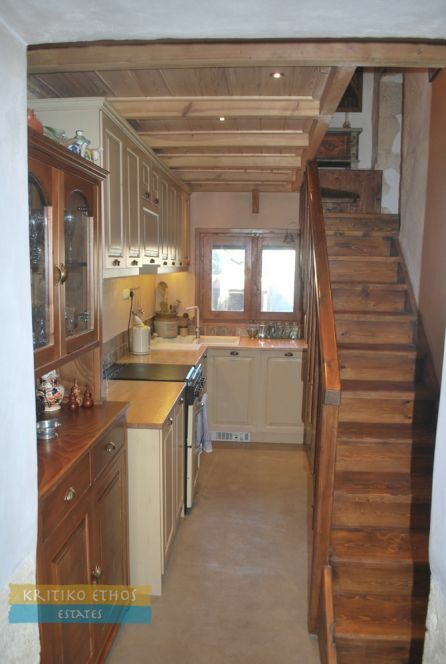 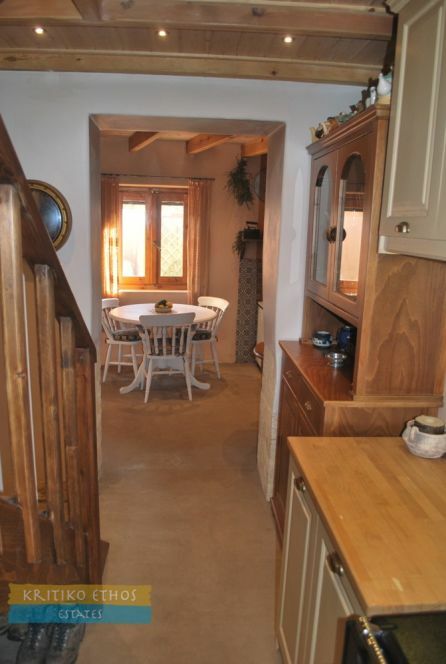 To the right, one enters the dining and kitchen areas, with a back hall and shower room beyond. 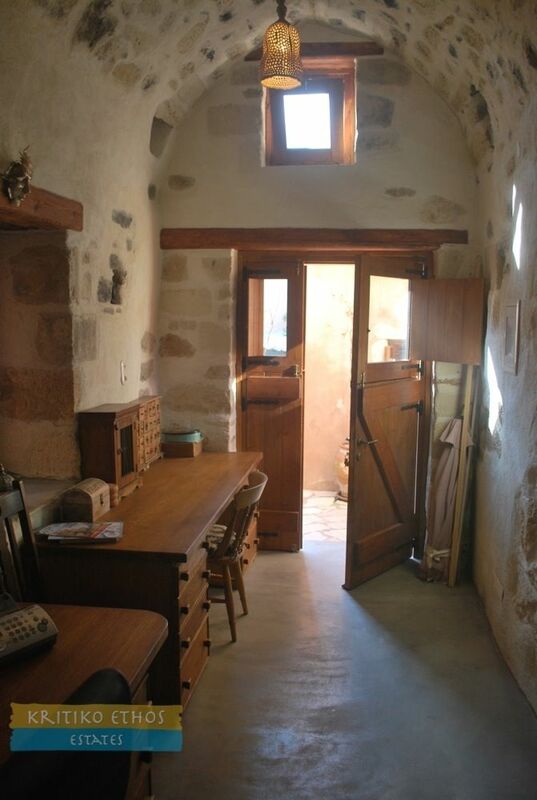 A doorway from the back hall leads out into the courtyard. 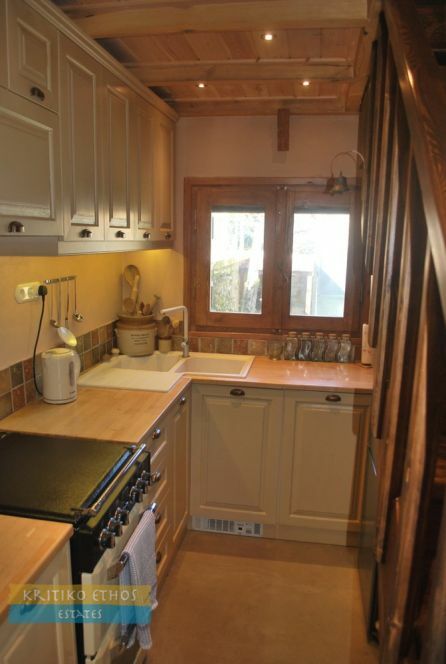 The wood-burning stove in the dining area can also be used for cooking, while the kitchen cupboards have been beautifully constructed by a local craftsman. 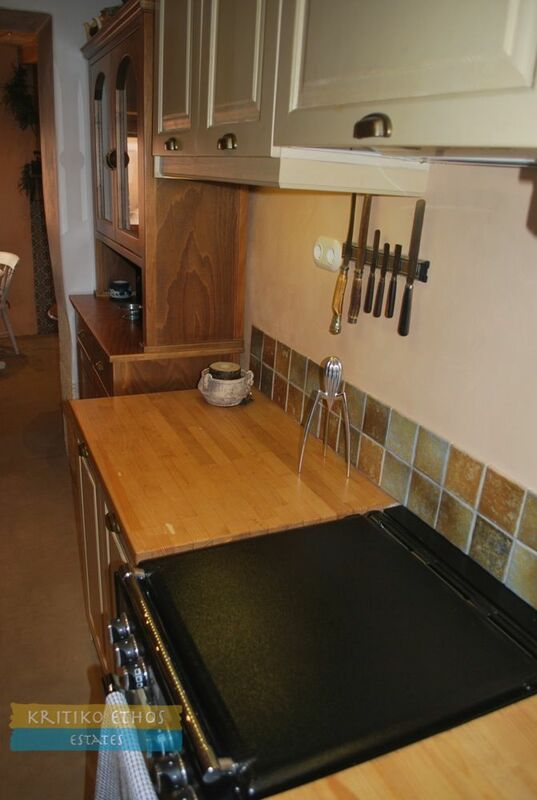 An electric under-cupboard heater provides instant warmth if the fire has been let to go out! A wooden staircase leads up from the kitchen, past a storage and cupboard area, to a delightful bedroom, with dual aspect, above the camaras. 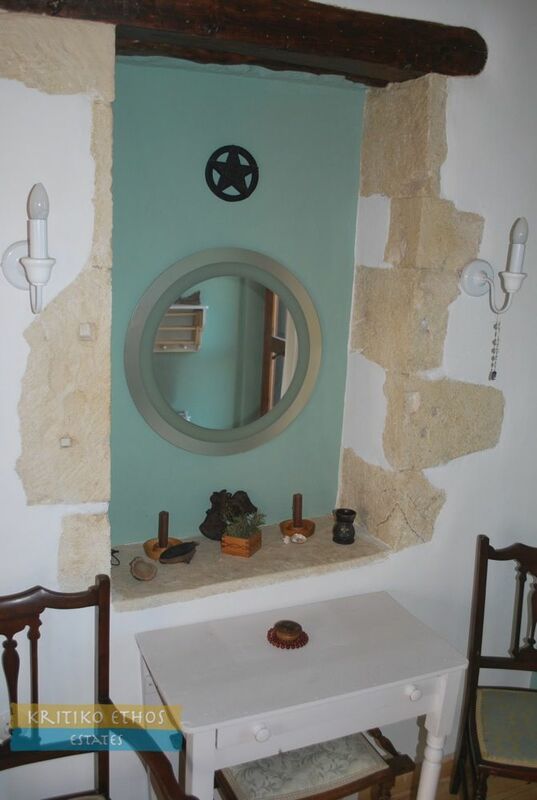 From here, the original stone stairs lead to the landing between the two main bedrooms and a door out to the main balcony. 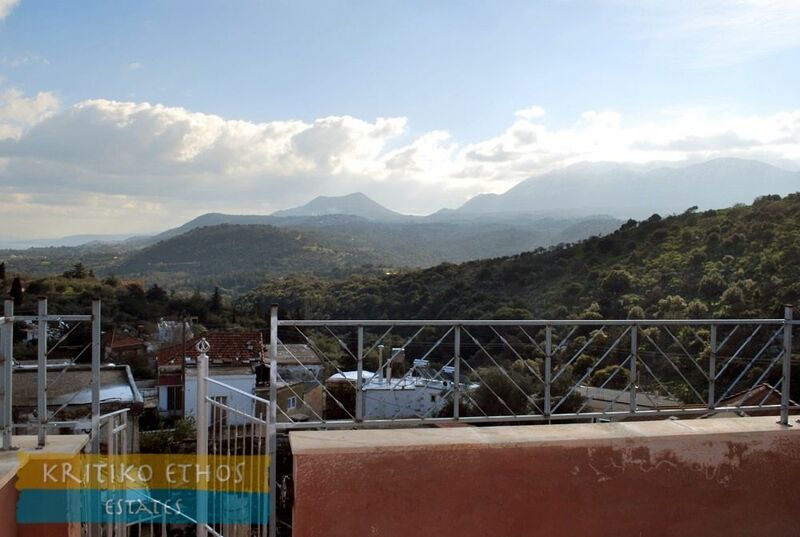 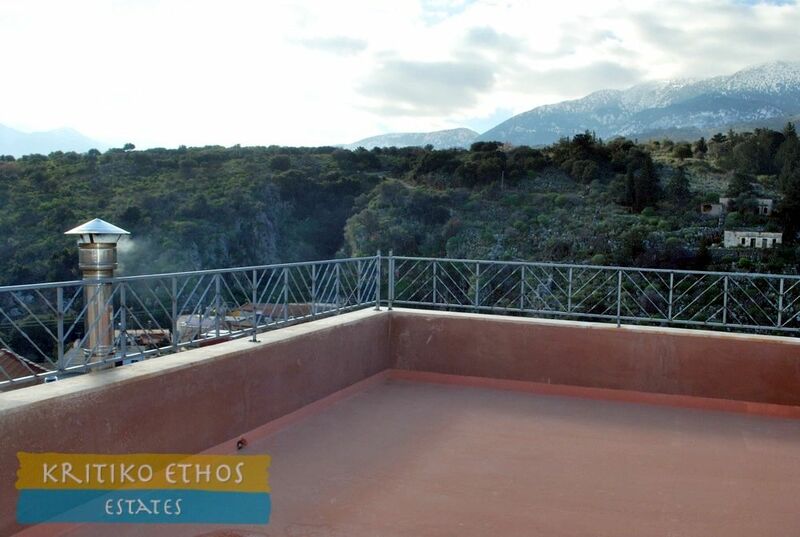 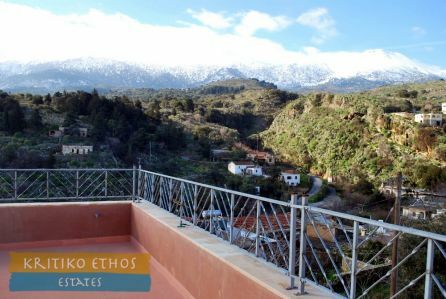 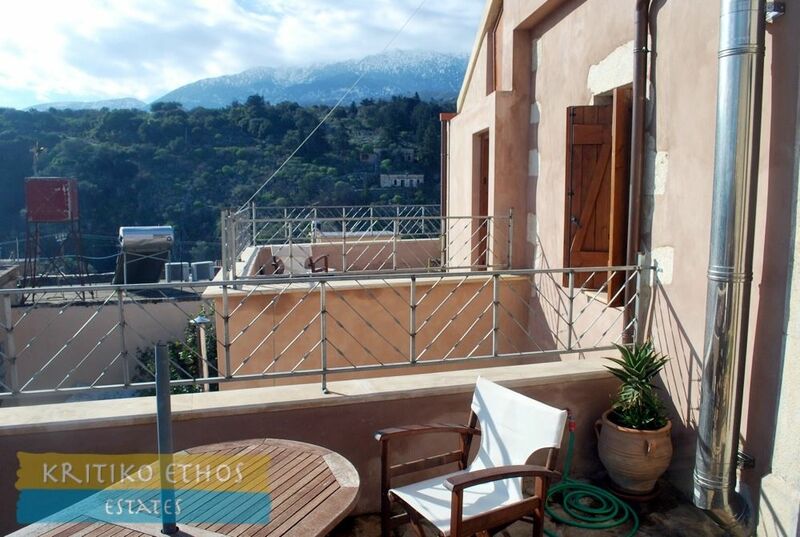 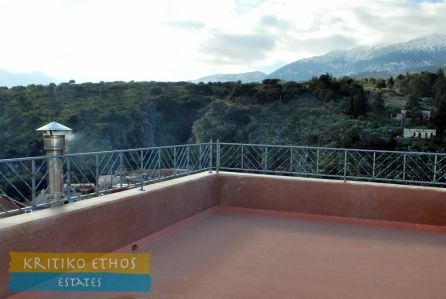 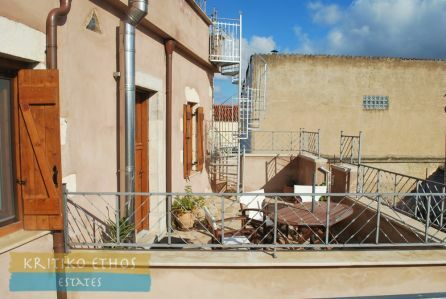 From this balcony, a spiral staircase affords access to the large roof terrace, with spectacular and truly panoramic views to the White Mountains, the sea towards Rethymno, Eastern Crete, as well as the village and the verdant countryside. 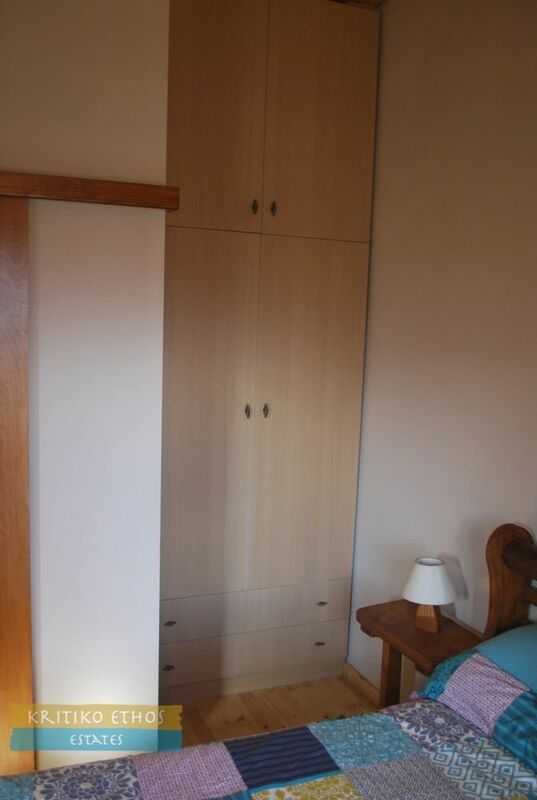 The spacious guest bedroom has large cupboards, an en-suite shower room and kitchenette. 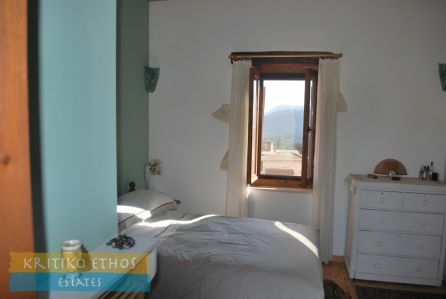 The main bedroom, with spectacular views to the east, south and west, opens into the en-suite bathroom. A utility area with built-in wardrobe is adjacent. 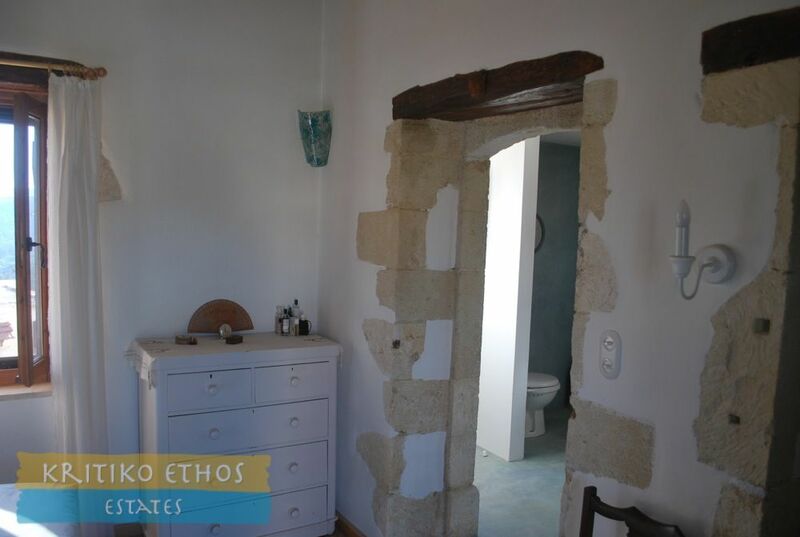 A door from the bathroom leads out to a private balcony while there is access to a another balcony from the bedroom itself. 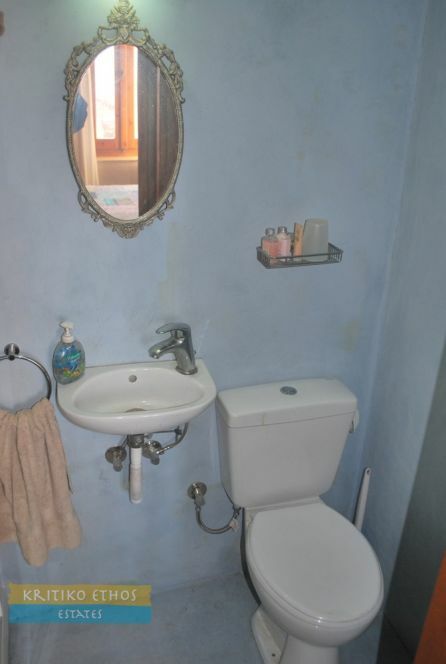 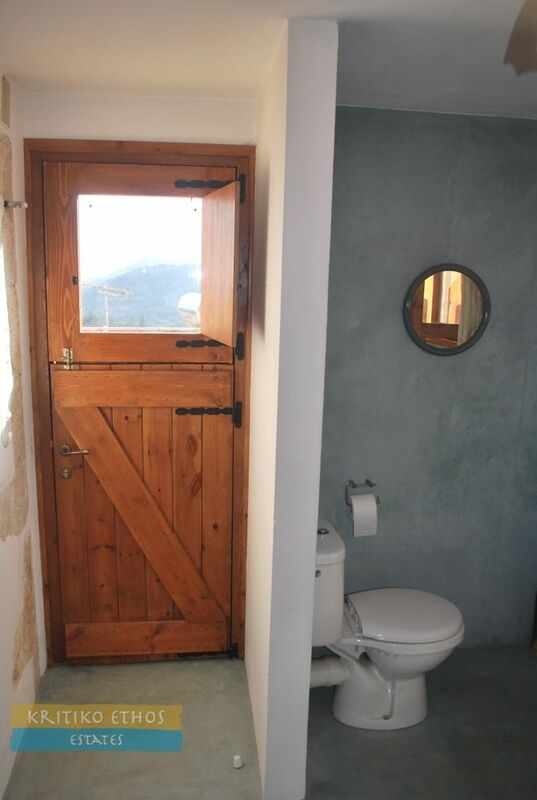 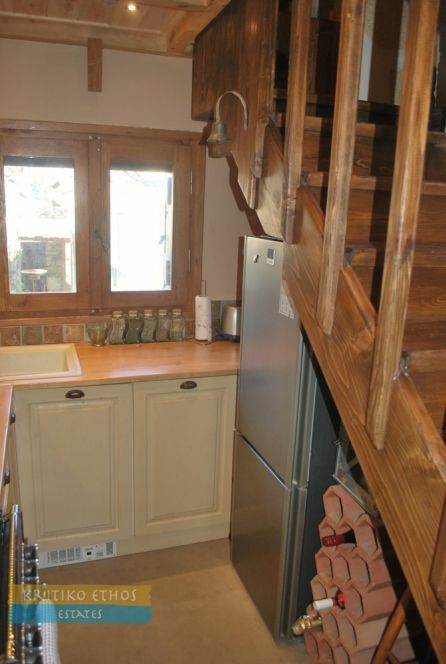 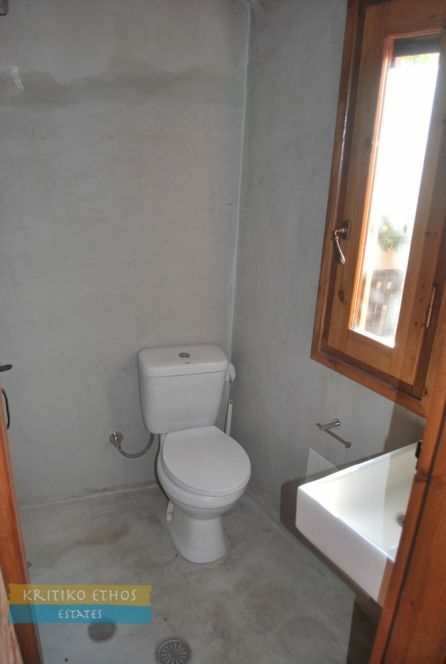 The bathroom also has an under-cupboard heater. Vafes is a thriving community of about 170 residents, with tavernas, kafeneion, shop, mini-market and olive press. 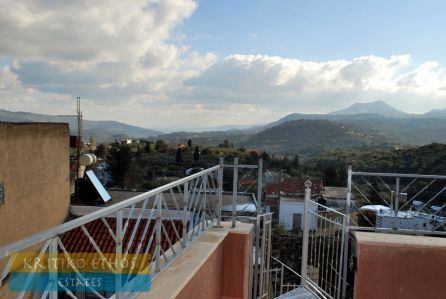 It is only three kilometres from the town of Vrysses with its supermarkets, shops, tavernas, bank, school, garage and post office, as well as the municipal offices of Apokoronas. 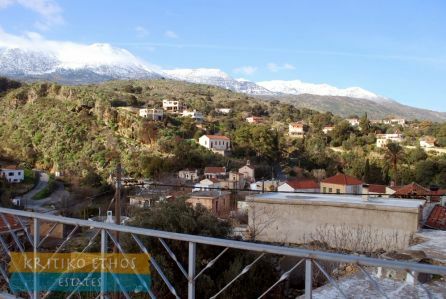 The excellent beaches of Georgioupoli and Kalyves are easily accessible and Xora Sfakion, on the south coast, is less than an hour’s drive away. 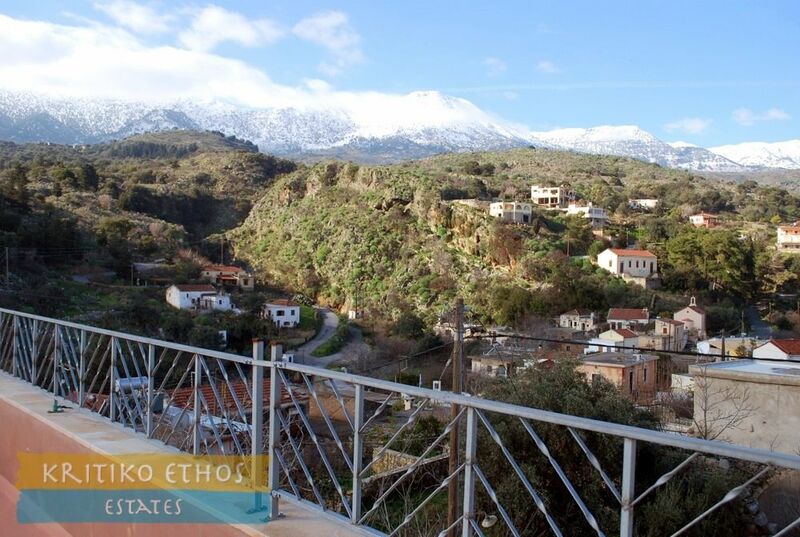 Vafes is roughly equidistant from Xania and Rethymno, either of which can be reached in about half an hour by car. 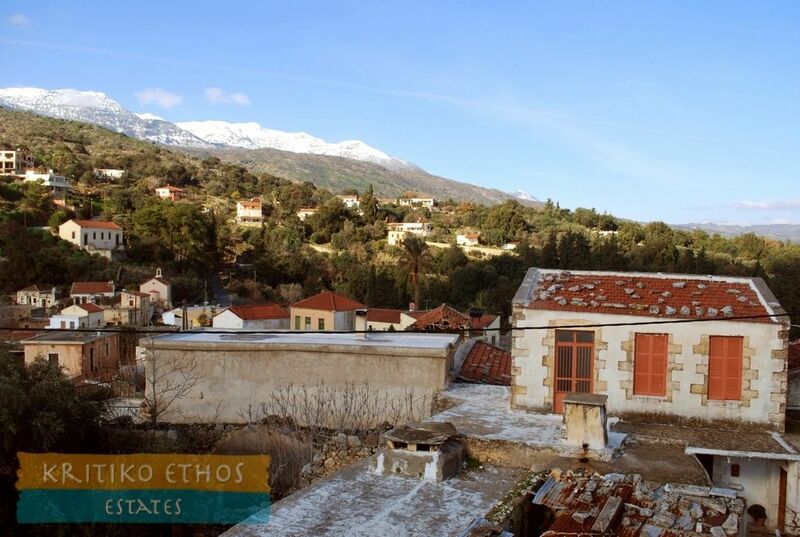 Vafes lies in the foothills of the White Mountains and has a long and proud history of resistance against oppression. The ossuary shrine at the entrance to the Krionerida cave is a poignant memorial to one hundred and thirty men, women and children who were asphyxiated by the Turks in 1821. 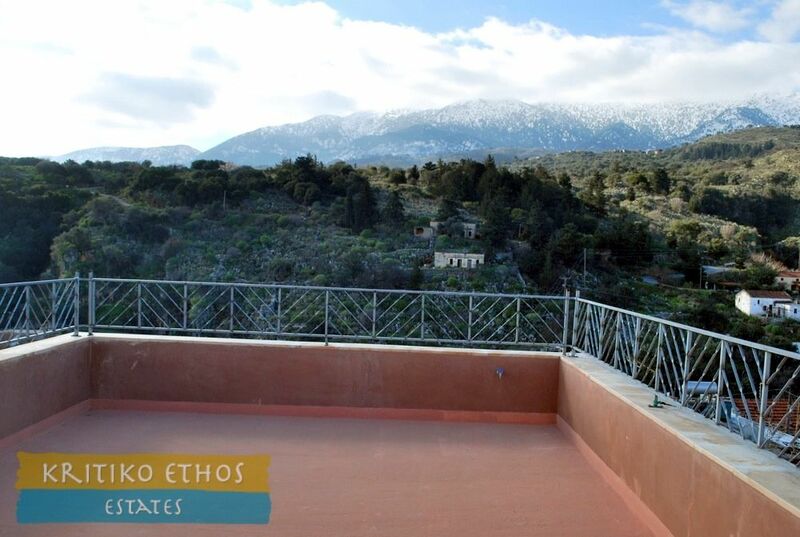 More recently,1941-1942, the home of Nico Vandoulakis became known as the British Consulate because of his assistance to the likes of Xan Fielding, Tom Dunbabin, Patrick Leigh-Fermor and George Psychoundakis. 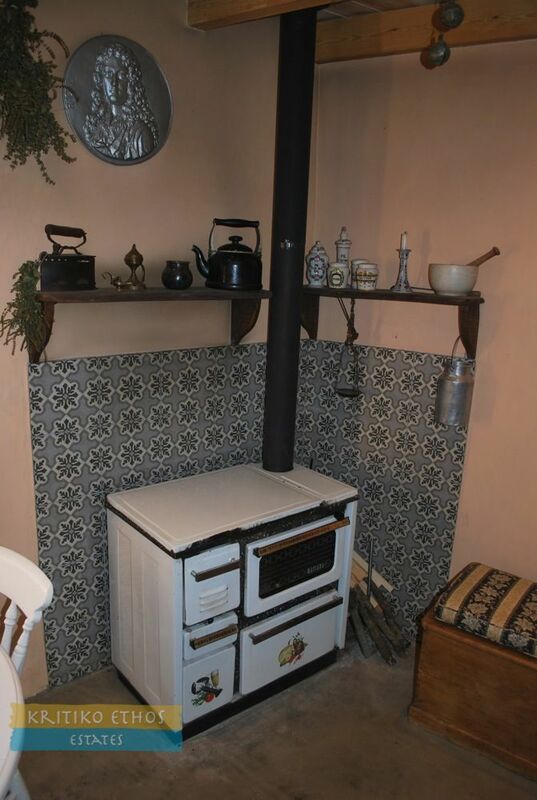 The photos in the gallery simply can not do proper justice to the home ... it really must be leisurely viewed to fully appreciate the warmth. Finally, many of the photos are in portrait mode. 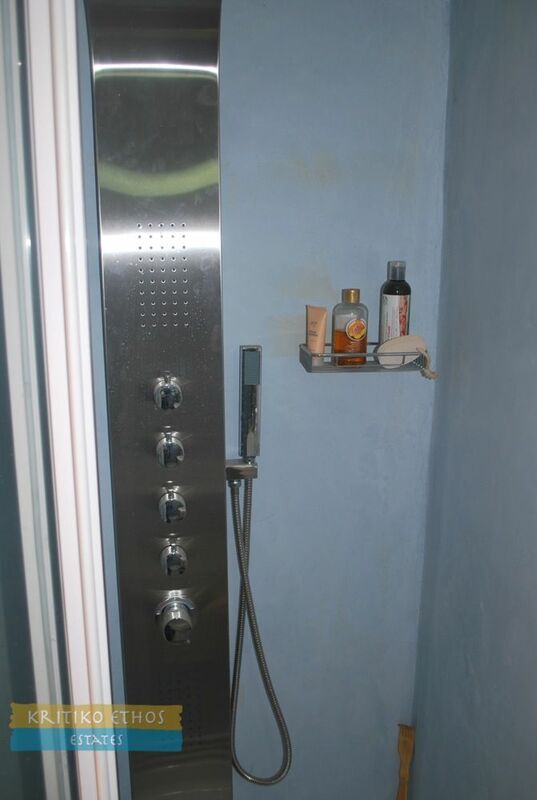 Please use full screen button to see all of the charm!